Anti-wrinkle injections are the most common procedure performed worldwide with many millions of patients having this procedure every year. Anti-wrinkle injections are safe and overall any risk is minimal. It is a little uncomfortable but most patients can return to work within 40 minutes and make-up can be applied immediately after the procedure. However, it does need to be administered correctly by a Doctor who specialises in the procedure. There are different brands of anti-wrinkle injections on the market, some with more efficacy that others. At The Adare Clinic, we use Allergan products. Anti-wrinkle injections are most commonly used to relax upper face wrinkles. The results take about 2 weeks for full effect and most patient are happy with the results for between 3 and 5 months. 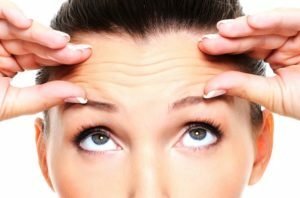 It is possible to either eliminate or greatly reduce the appearance of horizontal lines across your forehead or lines in between your eyebrows. Crow’s feet (lines around the eyes) are also treated using anti-wrinkle injections. Anti-wrinkle injections are also used in the lower face and neck to relax wrinkles, but this is an advanced treatment by experienced Doctors and is not performed in every clinic. A very common indication for anti-wrinkle injections is axillary hyperhidrosis (profuse sweating of the armpits) and this is also a relatively painless procedure with excellent results. Anti-wrinkle injections have also been used in the Speciality of Medicine for many years for different indications. We treat equal numbers of men and women with anti-wrinkle injections in the Adare Clinics. Cost of anti-wrinkle injections at the Adare Clinic is 9 Euros per unit of Botox. For example the glabellar area (in between the eyebrows) will typically need 21 units to be injected properly, but a male patient with a very strong frown line might require more units. The Crow’s feet around the eyes will usually need 12 units per eye etc. All prices will be discussed with the Doctor before the procedure.